Malaysia, April 10th, 2017 - Seiko Epson Corporation (TSE: 6724, "Epson") announces that cumulative global sales of Epson’s high-capacity ink tank inkjet printers have reached 20 million units. Epson first launched high-capacity ink tank printers in October 2010 in Indonesia. Since then, the printers have continued to be introduced in about 150 countries and regions. Sales have grown steadily in every region where these printers are sold. In June 2016, cumulative sales reached 15 million globally, withgrowth especially pronounced in emerging markets. According to Epson research, Epson’s series of high-capacity ink tank inkjet printers make up about 10% of the combined laser printer/inkjet printer market in those countries (which totaled about 45 million units in the fiscal year ended March 2016). Epson believes that the strong support from customers is the result of the merits of the series, including the elimination of the need to change ink cartridges, lower printing costs, and a smaller volume of resource waste from the use of consumables. Epson has promoted its high-capacity ink tank inkjet printers to customers of many types, in particular highlighting Epson’s credentials as a supplier of office products, along with the value customers can enjoy through a full product lineup. Epson will continue to emphasize the advantages its technical expertise and strong products offer as we work to further expand our business. Epson forecasts 25% year-on-year unit sales growth for these printers in the fiscal year ended March 2017, and that these products will account for approximately 40% of Epson inkjet printers sold in the same period. “High-capacity ink tank inkjet printers offer customers the ability to print without worry about the cost or running out of ink,” said Koichi Kubota, director, managing executive officer and chief operating officer, Printing Solutions Operations Division. “Epson’s unique Micro Piezo inkjet technology achieves stable, high-level printing performance. Customers appreciate the environmental performance, too: with no ink cartridges to change, the series generates little waste. 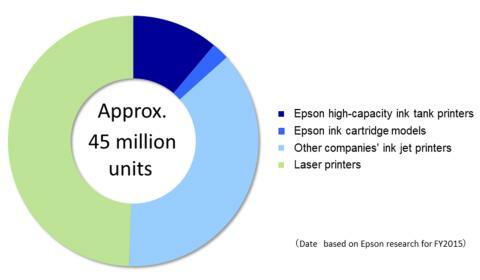 These factors have helped Epson’s high-capacity ink tank inkjet printers reach a cumulative 20 million units sold globally.